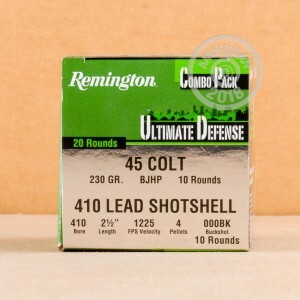 Remington's got you covered for self defense with this 410 Bore/45 Colt combo pack! They have combined two deadly products into the convenience of one package that's sure to give you the peace of mind you deserve. The powerful 410 load contains 4 pellets of 000 buckshot for tight patterns and one-shot confidence. The 45 Colt has a 230 grain bonded jacketed hollow point bullet to penetrate deeply and create a devastating wound. This ammo will feed smoothly into your combination handgun. 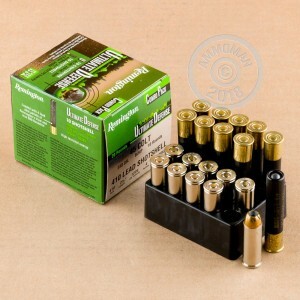 Remington has never been shy about taking their self defense ammunition to the max. Their reputation continues to be proven with this product. Remington has been producing high quality firearms and ammunition since 1816. Order these 20 rounds and see for yourself! 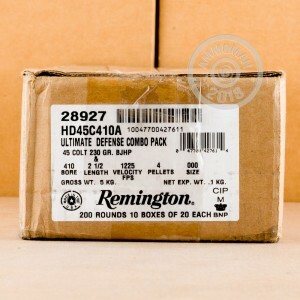 Note: Remington has changed their packaging on this product. Rest assured you are getting what you ordered inside the box if it arrives a bit different on the outside.